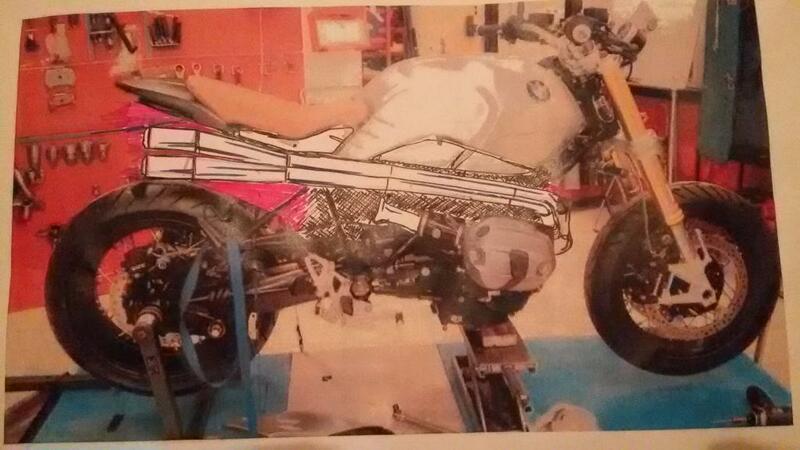 Nine dealers from Norway is in and here you get an idea of how I work and solve the task on MC Tuning’s BMW. Sometimes I take an picture of the customers bike and print out. RThen its easyer to sketch and explain how both me and the customer see and want the layout. 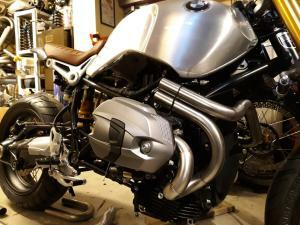 We did this on this R nine T also and I sketched an Dirt track inspired double exhaust as my vision. 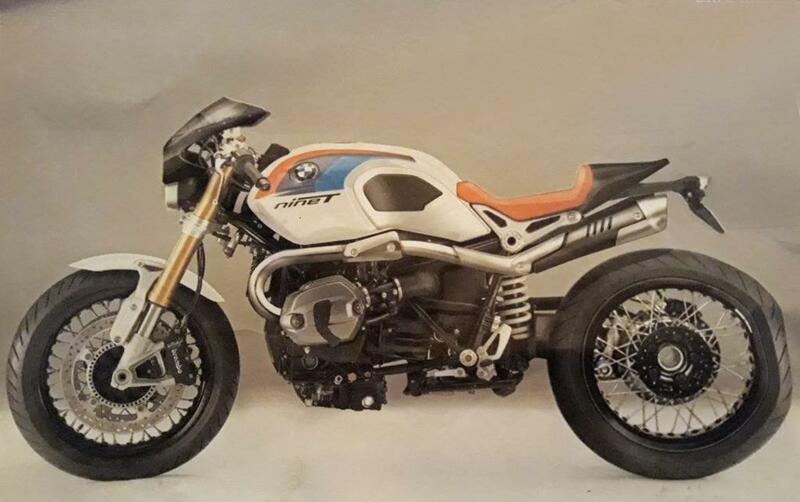 MC Tuning wanted a little more curvy shape and showed me a picture of another bike they had found as inspiration. Great! Now I can start and make it happen. 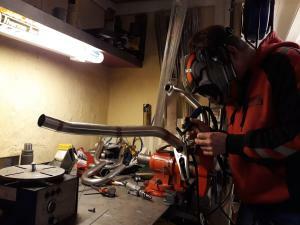 Now I must order the stainless steel tubes and bends and I have to predict how many bends I need. 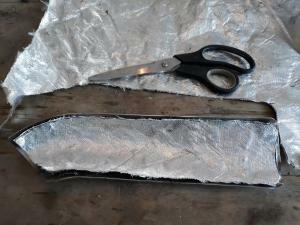 First I test a little with flexible aluminium ventilation tubes to get an idea. I allways use U-bends witch i cut and weld together. 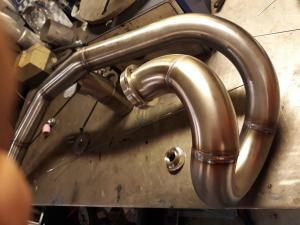 Many years ago, when I started doing exhaust I often made sections of bend and sections of strait tubing witch I welded together, but then you get a weld in every end of the bend or strait. Now I try to keep the amount of welds to a minimum and you see an bend continues into a strait without a weld on my current manifolds. I think it is beautiful when I manage to combine bends with different bend radiuses. 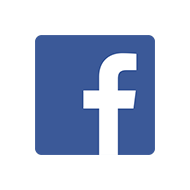 It looks a bit moore “organic” and get a kind of nicer visual flow. 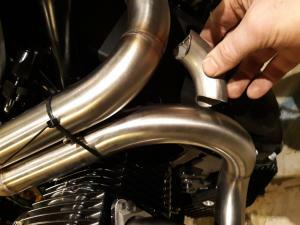 And If I have two paralelle tubes going into a bend together I think the outer one shoukld have a larger radius so they look like they belong togehter. 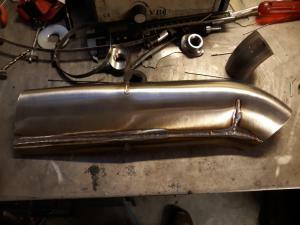 First I build the complete exhaust system with parts that are cut and fitted togehter just by three tag welds in each joint. 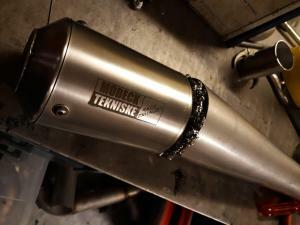 Then I make the mufflers, that shall have a conical start and then a sylindrical end. But the distance between them must be equal and paralell witch is a pain to do. Its a lot of testing, grinding and fitting to make it good. But the better the fitting is the easyer it will be to weld it together. 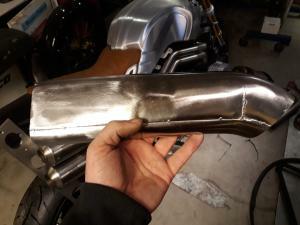 The mufflers are filled with Stainless steel scrubble in the front section, this section will be welded and it is not possible to repack them. But this scrubble last forever so that will be fine. 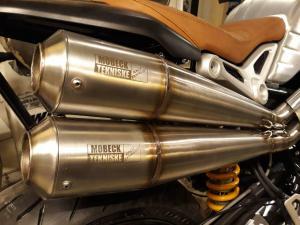 In the rear part witch is based on Race mufflers from Burns Stainless there is muffler packing for best possible sound absorbtion. 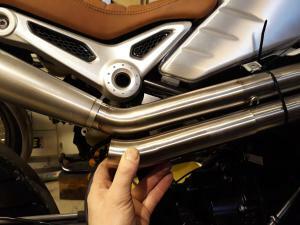 These mufflers can be repacked. 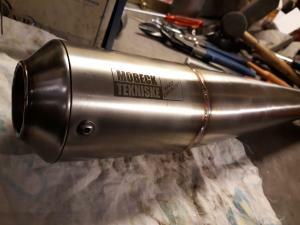 I also add a M8 nut in the center so I can mound a dB killer inside later After a few attempts I finally get the mufflers paralell and pointing in the right direction. Now when everything is fitted and correct I can weld everything with my TIG. 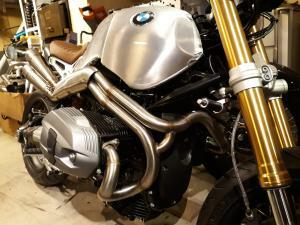 MC Tuning want brushed finish and all welds wisible. So I better weld with care. This last picture is taken a few weeks later. 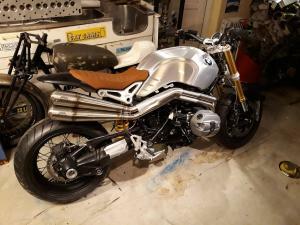 MC Tuning Trondheim has finished the rest of the details and also done a one of a kind paint scheme. 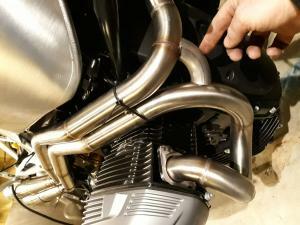 Beautiful lines that follow the bikes curves and makes the factory pipes look like a stuck on afterthought.